Now in it’s 7th year, the Franciscan Well’s Cask Ales and Strange Brew Festival is the first beer gathering of 2019, running from Thursday the 31st of January to Saturday the 2nd of February. The festival celebrates cask conditioned ales from a variety of Irish brewers and also show cases their growing experimentation & their ability to challenge the norms of brewing by hosting a range of special brews using curious and interesting ingredients. ‘Cask beer has become increasing more popular, the beer is much lower in carbonation and is served at room temperature which allows the beers full flavour to shine through’ says Kate Clancy, Marketing Manger of the brewpub. Lough Gill, Dot Brew, West Cork Brewery & 9 White Dear are just some of the breweries at the festival with over 20 cask engines rotating a range of brews. All breweries attending will also compete in the Beoir Cask Competition which will be judged by the national beer enthusiasts club on the Saturday 1st. As always festival goers will be able to enjoy freshly made wood fired pizzas from Pompeii, sip on the Well’s new cocktails from the MONK cocktail bar and kick back with some live entertainment. This year the festival takes on a quirky circus theme and people are asked to watch out for some live street performers on Saturday the 2nd from 5pm. ‘Having the Strange Brew element to the festival enables us to think outside the box, so we thought, why wouldn’t hula hooping and beer go together’, laughs Kate. 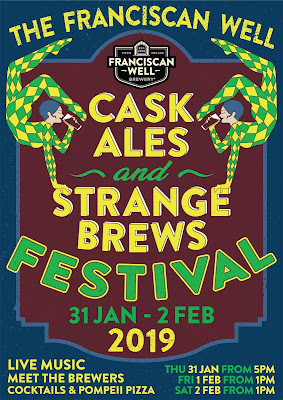 The Franciscan Well, based on North Mall will play host to many key beer festivals though-out the year, such as their annual Easter Beer Festival, October festival and their newly added Fem-Ale Festival.